The Manuscript, Archives & Rare Book Library (MARBL), now a part of our newly-formed LITS division, will be using LUNA to deliver images in a new high profile image collection this fall. A couple of years ago, Faculty Services contracted with LUNA Imaging to host Emory University Unique Image Collections at http://digitalgallery.emory.edu. The only customers at the time were the Art History Department and The Michael C. Carlos Museum. MARBL has already added a Historic Maps collection to LUNA and now the Robert Langmuir Collection will fully demonstrate the capabilities of this image management system. 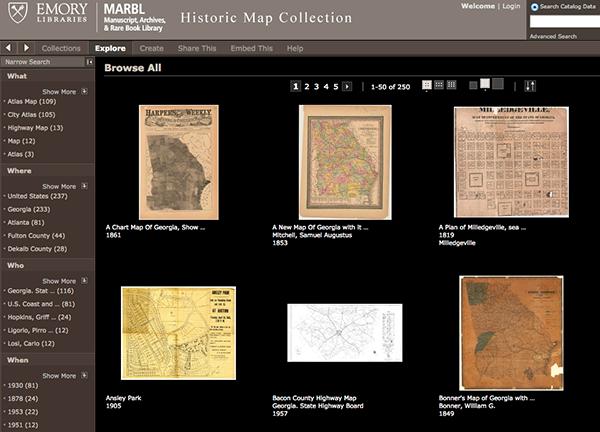 Emory’s MARBL collection of maps, hosted by LUNA. Coming soon: the 10,000 images of the Robert Langmuir Collection. A general overview of the MARBL collections can be found at: http://marbl.library.emory.edu/collection-overview-1. According to LUNA, their software “makes it easy to organize, manage and deliver media and collections. Ours is the only solution available that combines both powerful delivery tools with robust content management tools. You don’t have to settle for one without the other.” The use of a third-party vendor for image management demonstrates the flexibility that can be achieved through partnerships of this kind. This entry was posted in Projects and Processes and tagged Academic Technology Services, Faculty Services, Luna Imaging, MARBL. Bookmark the permalink. Post a comment or leave a trackback: Trackback URL.